Tea Tree Essential Oil is an eminent and versatile oil that can be used on almost any part of the body for almost any ailment. The positive effects of Tea Tree Oil are powerful and have beneficial impacts on interconnected body systems. It is reputed to cleanse, purify, and rejuvenate the skin, to promote healing and relaxation, to enhance and support immune function, and to eliminate bacteria, both on surfaces and in the air. It can be used in numerous body care products ranging from skin and hair care to emotional care through aromatherapy. This article highlights what can be achieved with natural homemade recipes that use the advantages of Tea Tree Essential Oil. Used in aromatherapy, the calming fragrance of Tea Tree Essential Oil has demonstrated its ability to naturally support and boost immune system health and fight infections, as it diminishes the detrimental feeling of stress, which facilitates illness. It is beneficial in treating issues with sleeplessness, acting as a sleep aid by reducing any aches and pains that can cause insomnia. Its herbaceous scent also uplifts the mood and boosts mental clarity. Tea Tree Oil’s expectorant properties also make it effective in facilitating the relief of congestion and respiratory tract infections. As a disinfecting air spray, Tea Tree Essential Oil acts as a natural, anti-microbial, non-toxic air freshener that removes bacteria, viruses, and mold from the environment. By placing a couple of drops in a steaming bowl of hot water and leaning over it to inhale the aromatic vapors with a towel draped over the head and the bowl, Tea Tree Oil can be used to help a sinus infection. Vicks Vapor Rub 1 Tbsp. Add the essential oils and vapor rub to the water and stir. Inhale through your nose and exhale through your mouth. Enjoy the relief from congestion and other cold symptoms. Diluted with a carrier oil and used topically, Tea Tree Oil’s sudorific properties may help to strengthen and stimulate the immune system to increase its ability to fight off infection. It does this by promoting perspiration to eliminate internal bodily toxins. Known to have anti-microbial and anti-inflammatory properties, this soothing oil provides relief to minor burns, sores, bites, and cuts by decreasing pain, inhibiting bleeding, eliminating bacteria from the wound, and promoting the faster healing of wounds and scars. Tea Tree Oil relieves muscle aches as well as pain associated with illness and arthritis. Massage over the body for a boost to the immune system. Add all oils to a dark 120 ml (4 fl. oz.) glass bottle and shake well to blend thoroughly. Gently massage the blend into feet and toes. When used in a bath, Tea Tree Essential Oil stimulates the body’s immune function through its antifungal and antibacterial properties, which combats the harmful effects of contaminants on the skin by inhibiting bacterial growth and reproduction. It heals skin conditions, such as Athlete’s Foot, while soothing burns and cuts. Its antiseptic properties eliminate bodily toxins and disinfect pores to prevent clogging that can lead to acne-prone skin. It can lighten scars while replenishing the skin’s natural oil balance. Inhaling the fragrance of bath water scented with Tea Tree Oil can relieve inflammation that causes not only a sore body but also sinus pressure and headaches. Its decongestant and expectorant properties make Tea Tree Essential Oil beneficial for reducing or relieving respiratory issues such as coughs, colds, and the flu. It does this by loosening phlegm and mucus in the nose and throat to facilitate their elimination. Its anti-bacterial activity fights respiratory infections and inflammation from ailments such as bronchitis, laryngitis, and tonsillitis. Add Tea Tree Essential Oil. Mix well. Carrier Oil (Grapeseed, Almond, Jojoba, Olive suggested) 2 ½ Tbsp. Fill a large container or spa foot bath with 8 cups (2 L) of hot water. Steep sprigs of Rosemary in this water for 10-15 minutes. Blend the Tea Tree Oil into the Carrier Oil. When the Rosemary herbs have been immersed for 10-15 minutes, add the Tea Tree and carrier oil blend to the water. Soak feet for 15 minutes twice daily. If the oil and water separate during the soak, simply swish the water around with feet. Towel dry feet and apply moisturizer. Tea Tree Essential Oil restores the complexion and improves the look and feel of blemished skin by cleansing, purifying and toning skin, soothing irritations, slowing the look of aging with its powerful anti-oxidant action, and improving the look of pores. When combined with other essential oils and diluted, Tea Tree can also be used in a toner for balancing oily skin. In hair care, Tea Tree Oil is known to be an antiseptic that effectively eliminates lice and nits. By soothing dry, flaking skin this fungicidal oil can refresh and moisturize the scalp to eliminate dandruff while boosting circulation, thereby stimulating the growth of hair. Grapeseed Carrier Oil 2 Tbsp. Vitamin E Oil 1 Tbsp. Combine all ingredients in a dark glass container/jar. Screw the jar lid on tightly and shake the jar to thoroughly blend all ingredients. Store finished product in a cool place. Tea Tree Essential Oil 1 Tbsp. Fill a medium-sized pan with 3 cups of water (or enough water to immerse the bottom half of an 8-ounce mason jar). In an 8-ounce mason jar, combine the Olive Oil and the beeswax. Place the jar containing the blend into the pan of water to create a double boiler. Heat the blend until the beeswax melts. Stir the Olive Oil and beeswax mixture to ensure a thorough combination. Once the beeswax is completely melted, add the Tea Tree Essential Oil. Pour blend into metal tins or tubes, leaving an opening. When salve is cool to the touch, apply to lips, scratches, insect bites, bee stings, itchy spots, dry skin, and sore muscles. This salve can be made entirely with a double boiler; using a mason jar simply creates less of a mess. In a heat-safe bowl, combine the Beeswax, Shea Butter, and Coconut Oil. Place a small saucepan filled with a couple of inches of water on the stove over low heat. Place the bowl on top of the pan to melt the wax and oils. Remove the bowl from the heat to stir in the Baking Soda and Cornstarch. Add in the essential oils and combine the mixture thoroughly. Pour the mixture into soap or lotion bar molds (ice cube trays, loaf pans, silicone molds or other Tupperware will also work), and allow them to harden for several hours. To make moisturizing lotion bars, leave out the Baking Soda and Cornstarch. Due to the absence of water in this recipe, the final product will last for a minimum of 1 year. In a mixing bowl, beat together all the ingredients using a whisk or hand blender until thoroughly combined and smooth. Scoop the body butter into a tightly sealed container and store it in a cool, dry place for up to 6 months. To use, scoop a small amount into hands and massage into dry areas of skin. Vicks Vapor Rub: This salve contains Camphor and Menthol, which contribute to its ability to temporarily relieve minor aches and pains in muscles and joints. Its minty scent promotes easy breathing by decongesting the nasal passages and relieves headaches. It clears up acne, moisturizes skin, and soothes itchiness and inflammation. Thyme Essential Oil: This oil is known to be one of the strongest antioxidants and as such it supports the immune system. By eliminating infections, it treats colds and coughs, detoxifies the body, decongests the nose and chest, increases circulation, and supports the digestive system. Thyme Essential Oil is also beneficial for naturally balancing hormones, reducing anxiety, and relieving insomnia. Myrrh Essential Oil: This antioxidant, antibacterial, and anti-fungal essential oil is beneficial for reducing the appearance of aging due to its ability to rejuvenate skin, heal wounds, and soothe inflammation. Its expectorant property reduces phlegm, thereby relieving cough and cold symptoms such as congestion. Elemi Essential Oil: This analgesic oil relieves the pain associated with colds, fevers, sprains, headaches, and muscular aches. Its strong expectorant properties relieve chest and nasal congestion to promote easier breathing. As an antiseptic, it defends the body against infection caused by bacteria, fungi, and viruses. Rosemary Sprigs: This antibacterial and antifungal herb helps to not only eliminate and prevent odors but to also reduce inflammation and relieve pain. By boosting immunity, it protects the body from bacterial infections and eliminates toxins. It is also known to stimulate circulation, heal skin conditions, and slow the appearance of aging. 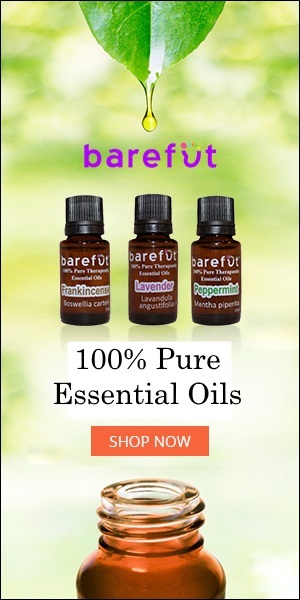 Carrier Oil: Carrier oils help to dilute essential oils before topical application, as their potency can be harmful when used in high concentrations without dilution. Carrier oils also help essential oils remain on the skin longer without quickly evaporating. Grapeseed Carrier Oil: This is a light, fast-absorbing oil that promotes the speedy healing of wounds and minimizes the look of scarring. It is odorless and is not known to stain sheets. Grapeseed promotes the excretion of most toxins from the body thus boosting blood circulation. Raw Organic Honey: This type of honey is full of enzymes and nutrients that add shine to dull hair without leaving it feeling heavy. As a humectant, it draws in and allows hair to retain moisture while also strengthening it and promoting healthier growth. Beeswax: When added to creams and butters, Beeswax acts as a thickening agent and makes them more spreadable on the skin. By exfoliating skin and helping it retain moisture, Beeswax prevents skin from drying out and promotes the appearance of rejuvenated skin. This wax naturally has the scent of honey and can calm and soothe. Coconut Oil: This oil mixes well with other oils in a product and extends the product’s shelf life. It penetrates the skin quickly and adds moisture without clogging pores. Coconut Oil has antifungal and antibacterial properties and helps combat unpleasant odors. Baking Soda: This finely powdered salt is known to be an excellent exfoliant that can remove dead skin cells while also balancing the skin’s pH level, which helps maintain clear, even-toned skin. Baking Soda is able to absorb moisture and eliminate the bacteria that contribute to unpleasant body odors. It helps to detoxify the body and soften the skin to make it smooth. Cornstarch: This scent-free powder soothes skin irritations such as sunburn and topical allergies. By absorbing moisture, it prevents body odors from forming. Jojoba Oil: This carrier oil is actually a liquid wax that resembles sebum, which is produced by human skin glands and which acts as a conditioning agent for skin. It is best known for preventing skin irritations and for its ability to balance skin’s oil production by removing excess oil. It locks in skin’s moisture and protects it from harsh environmental elements.